Wayne Simpson and I seem to be in a similar head space this week. Interesting considering how far apart we live (nearly 3200 KM). More on that soon. The title of this post is a play on the song Midnight Dark Water by the Ketch Harbour Wolves. The album, Dead Calm Horizon, has found itself on near constant repeat for me lately. They are a special kind of band. It’s been ages since I was able to get out shooting landscapes, something I hope to do a bit more of soon. It felt so good to stand in the quiet at the waters edge, waiting for the shutter to close and just listen. I have missed that. 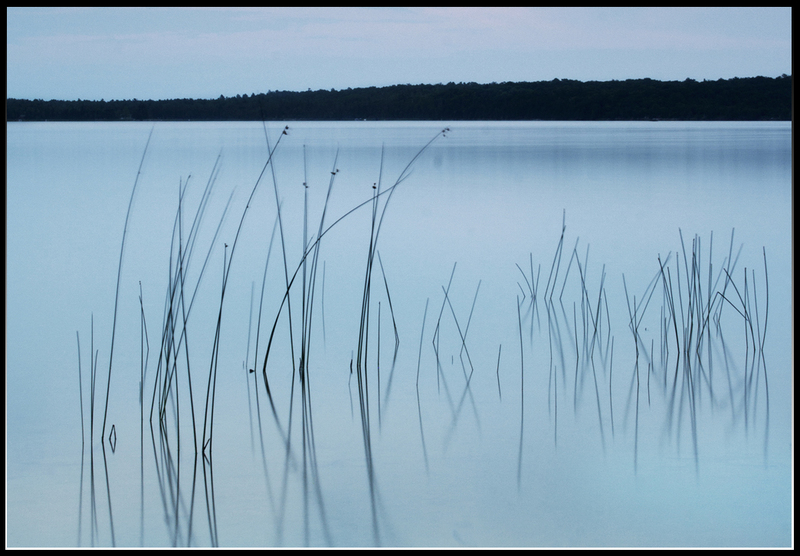 This photo was taken just around sunset at Windfall Lake on Manitoulin Island. I took a few variations on this shot before finding a something I liked. The longer exposure smoothed out the water and allowed a little motion in the reeds to show. I kind of like the serene mood it conveys. I hope you do as well. This entry was posted in Details, Landscapes, Photo of the Week, Travels. Bookmark the permalink. Another great shot by you Mike. I love the exposure shots. Beautiful. Thanks Lee! I was happy with how this turned out. It’s a bit more subtle than my usual stuff – a nice change it feels like. For my money, this is one of your best. Great shot Mike! Love the reflections! What was the camera setup for this shot? Thanks buddy! I was pretty happy with this one. I have a few others from this trip to post as well. This was a 30 second exp. at f16 I think, with a 3 stop solid ND, and a 1 stop soft grad pulled down to the mid-point of the water and a 2 stop soft grad pulled to the top of the tree line.